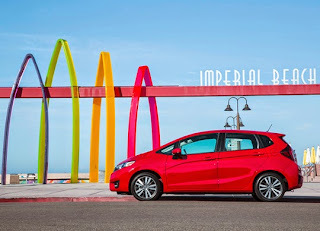 The completely-redesigned 2015 Honda Fit is a really interesting little vehicle for a number of reasons, not the least of which is that it somehow takes a class of vehicles – subcompact hatches – and makes it cool. On the one hand, these vehicles always have existed to give consumers an inexpensive new vehicle option that also happens to offer some measure of utility, but price typically has been the operative word in this segment, and we’ve certainly seen some of the competition release some vehicles that were inexpensive but didn’t offer much else. 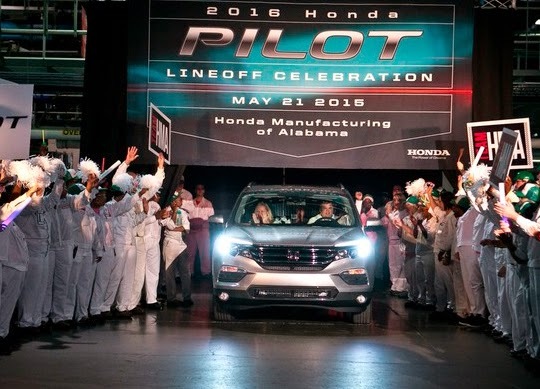 More than 1,500 associates at Honda Manufacturing of Alabama (HMA) today celebrated the start of mass production of the all-new, thoroughly redesigned and reimagined 2016 Honda Pilot, slated to go on-sale next month at Honda dealerships nationwide. HMA is the exclusive manufacturer of the family friendly, up to 8-passenger Honda Pilot SUV and its advanced direct-injected i-VTEC V-6 engine. "Today we celebrate the incredible dedication of our Alabama team to delivering an outstanding new Pilot that will set the course for others to follow," said Jeff Tomko, president of HMA. "I want to congratulate our associates for their unqualified commitment to building a new Pilot of the highest quality that exceeds the expectations of our customers." Designed, developed and manufactured in America, the all-new 2016 Honda Pilot SUV is improved in every imaginable way – with dynamic new styling, an even more spacious and family-friendly cabin, a more powerful and efficient new powertrain, and more advanced technology and premium features than ever before. All three generations of the Honda Pilot have been designed and developed in America by Honda R&D Americas, Inc. at its Los Angeles design studio and Raymond, Ohio R&D center. "Our U.S.-based development team lives with the midsize family SUV everyday and we have applied our deep understanding into the development of this best ever, third-generation Pilot," said Marc Ernst, chief engineer at Honda R&D Americas in Raymond, Ohio and development leader for the new Pilot. "We advanced Pilot's dual-purpose character by increasing both family utility and personal sophistication to meet the needs of the driver and passengers in every dimension of their life." The Pilot is designed to achieve the highest safety ratings of any vehicle in its class, and offers Honda Sensing™, a comprehensive suite of advanced safety and driver-assistive technologies that can help drivers avoid a collision or mitigate its severity. The new Pilot joins a reinvigorated Honda light-truck lineup that includes America's best-selling SUV and 2015 Motor Trend Sport Utility of the Year, the 2015 Honda CR-V, and the just-launched Honda HR-V crossover, the new gateway model in Honda's triple-threat SUV/CUV lineup. The Pilot is produced alongside the Honda Odyssey, which is leading all other minivans in sales to individual American retail car buyers in 2015. Honda's Alabama-built light-truck lineup will be further strengthened when HMA begins production of an all-new Honda Ridgeline pickup early next year. Since its market debut in the 2003 model year, the Pilot has continuously advanced its unique combination of smooth ride comfort, accommodating interior packaging and overall efficiency that traditional SUVs lacked. The Pilot helped transform the SUV segment with better ride quality, top crash safety ratings, more interior space and increased fuel efficiency. Honda has been producing automobiles in America for more than 30 years and currently operates 16 major manufacturing facilities in North America. Eight Honda auto plants in the North American region, including four in the U.S., have the capacity to produce 1.92 million automobiles each year, using domestic and globally sourced parts. In 2014, nearly 98 percent of the Honda and Acura automobiles sold in the U.S. were produced in North America. Honda also operates 16 major research and development centers in the U.S. with the capacity to fully design, develop and engineer many of the products Honda produces in North America. Families with seniors in college either attended their graduation ceremonies recently or will do so over the course of the next week or two, and while there are few things more thrilling than seeing a child achieve something so momentous, the reality for the former students is that with college done, real adult life has no choice but to begin. 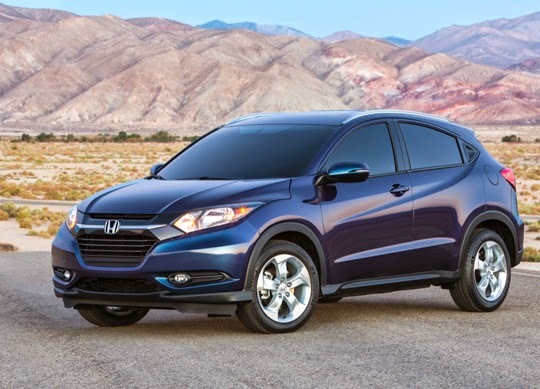 With bold and sporty coupe-like styling, SUV versatility, 35 mpg highway fuel economy rating (2WD CVT), and Honda packaging magic, the all-new 2016 Honda HR-V is set to challenge the growing entry crossover market when it hits Honda dealerships nationwide on May 15. The all-new Honda HR-V crossover will deliver incredible value with a long list of standard features and technologies including 17-inch alloy wheels, push-button electric parking brake, rearview camera with guidelines, Pandora® radio and Bluetooth® HandsFreeLink®1 – all for a manufacturer's suggested retail price (MSRP) starting at just $19,115. Available in LX, EX and EX-L Navi trims, the 2016 HR-V is powered by a highly refined and efficient 1.8-liter 4-cylinder 16-valve DOHC i-VTEC® engine producing a peak 141 horsepower2 and 127 lb.-ft. of torque3. The engine is paired with one of two efficient and responsive Honda transmissions, a seamless and sporty continuously variable transmission (CVT), available on all models, or an engaging, short-shifting 6-speed manual transmission, available on LX and EX models with 2WD. The HR-V also targets class-leading safety ratings and features Honda's next-generation Advanced Compatibility Engineering™ (ACE™) body structure for enhanced frontal collision protection. The HR-V is designed to achieve top safety ratings: an NCAP five-star Overall Vehicle Score from the National Highway Traffic Safety Administration (NHTSA) and a TOP SAFETY PICK rating from the Insurance Institute for Highway Safety (IIHS). Developed on the new global platform, the HR-V utilizes a center-mounted fuel tank layout and reconfigurable 2nd-Row Magic Seat® to deliver voluminous interior space along with a flexible cabin featuring multiple seating/cargo modes. With 100.1 cu.-ft. of passenger space and 58.8 cu.-ft. of cargo volume (LX FWD) with the 2nd-Row seats folded down, the HR-V has space to rival some competitors' midsize SUV offerings. The HR-V's dynamic appearance and sporty, solid stance is aided by its coupe-like cabin shape and bold and powerfully tapered face. Distinctive side contours, including a sharply upswept character line and deeply sculpted lower body flow into a tapered rear fascia that adds to the visual appeal. Concealed rear door handles further enhance the HR-V's coupe-like appearance. The equally sporty and sophisticated interior features an expansive, airy cockpit with an abundance of soft-touch materials and premium detailing punctuated by precise bezels, sophisticated stitch lines and up-market brushed chrome and piano black highlights – all fitting its mission as a youthful yet refined personal crossover vehicle. The three-meter driver's instrument cluster features “floating” illumination rings and Honda's ECO Assist™ feature, wherein the speedometer illumination changes from white to green depending on current fuel efficiency. Power comes from a highly refined and responsive 1.8-liter SOHC 16-valve 4-cylinder engine with i-VTEC® valvetrain, producing a peak 141 horsepower at 6,500 rpm and 127 lb.-ft. of torque at 4,300 rpm. The engine is mated to a sporty and fuel-efficient continuously variable transmission (CVT) with Honda “G-design” shift logic, or a slick-shifting 6-speed manual transmission (LX and EX FWD only). The HR-V is available with front-wheel-drive or with Honda's Real Time AWD with Intelligent Control System™ for outstanding all-weather traction and control. The HR-V utilizes a unique center-mounted fuel tank layout that enables the 2nd-Row Magic Seat® to fold completely flat into the floor, creating a more spacious and versatile interior package. Driving efficiency, handling performance and cabin quietness are further aided by an aerodynamic shape and a lightweight yet rigid body structure with significant noise-insulating materials and design features. The body utilizes Honda's next-generation Advanced Compatibility Engineering™ (ACE™) body structure for enhanced frontal collision protection, and 27 percent of the body is composed of advanced ultra-high strength steel for improved rigidity that enhances collision-protection, handling response, ride quality and a quiet cabin environment. Fully independent front and torsion-beam rear suspension systems with amplitude reactive dampers maximize rear seating and cargo space while also providing outstanding handling characteristics and ride quality. Electric Power Steering (EPS) provides a refined and sporty steering feel while minimizing energy requirements. All models feature power-assisted four-wheel disc anti-lock brakes with Electronic Brake Distribution (EBD) and Hill Start Assist, an Electric Parking Brake (EPB) with Automatic Brake Hold, 17-inch aluminum alloy wheels and 215/55R17 all-season tires. Utilizing advanced safety technologies and design features, including Honda's next-generation ACE™ body structure, the HR-V is expected to achieve top-class collision safety performance ratings – a 5-Star Overall Vehicle Score from the National Highway Traffic Safety Administration (NHTSA) and a TOP SAFETY PICK rating from the Insurance Institute for Highway Safety (IIHS), including a GOOD rating in the rigorous IIHS small-overlap frontal collision test. Standard safety and driver-assistive features include four-channel anti-lock brakes (ABS) with Brake Assist and Hill Start Assist; Vehicle Stability Assist™ (VSA®)6 electronic stability control system; an Expanded View Driver's Mirror; a Multi-Angle Rearview Camera7; dual-stage, multiple-threshold front airbags; driver and front passenger SmartVent® side airbags; side-curtain airbags for all outboard seating positions; and a Tire Pressure Monitoring System (TPMS)8. Honda LaneWatch®9 display is included with EX and EX-L Navi trims. The HR-V offers a high level of standard equipment for an affordable crossover vehicle, along with a long list of available premium features to accommodate a wide variety of consumer needs. LX and EX trims with front-wheel drive can be equipped with either the 6-speed manual transmission or sporty continuously variable transmission (CVT), and all models can be specified as front-wheel-drive or equipped with Real Time AWD™. Models with Real Time AWD™ are available only with a CVT. 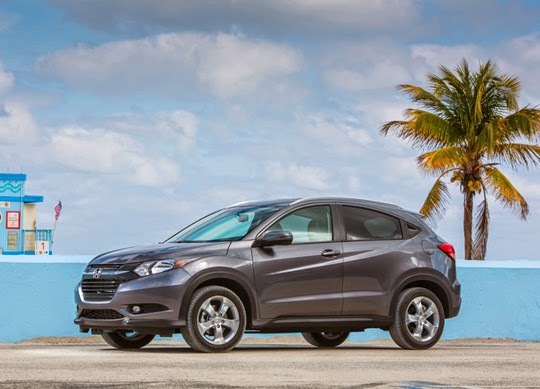 The 2016 Honda HR-V is covered by a comprehensive 3-year/36,000-mile new vehicle limited warranty and a 5-year/60,000-mile powertrain limited warranty. Additional benefits of ownership include Honda Roadside Assistance, which provides free 24-hour roadside assistance during the 3-year/36,000-mile new vehicle limited warranty term. The HR-V was developed by Honda R&D Co. Ltd. in Japan, and will be manufactured at Honda's eighth and newest auto plant in North America, in Celaya, Mexico. 1 MSRP (Manufacturer's Suggested Retail Price) excluding tax, license, registration, $880 destination charge and options. Dealer prices may vary. 4 Based on 2016 EPA mileage ratings. Use for comparison purposes only. Your mileage will vary depending on how you drive and maintain your vehicle, driving conditions and other factors. 5 LEV2 ULEV (Ultra-Low-Emission Vehicle) models as certified by the California Air Resources Board (CARB). 6 VSA is not a substitute for safe driving. It cannot correct the vehicle's course in every situation or compensate for reckless driving. Control of the vehicle always remains with the driver. 7 Always visually confirm that it is safe to drive before backing up; the rearview camera display does not provide complete information about all conditions and objects at the rear of your vehicle. 8 For optimal tire wear and performance, tire pressure should be checked regularly with a gauge. Do not rely solely on the monitor system. Please see your Honda dealer for details. 9 Display accuracy will vary based on weather, size of object and speed, and the display may not show all relevant traffic. The display is not a substitute for your own direct visual assessment of traffic conditions before changing lanes. 10 The Bluetooth® word mark and logos are owned by the Bluetooth SIG, Inc., and any use of such marks by Honda Motor Co., Ltd., is under license. 11 The USB Audio Interface is used for direct connection to and control of some current digital audio players and other USB devices that contain MP3, WMA or AAC music files. Some USB devices with security software and digital rights-protected files may not work. 12 The Display Audio Interface is used for direct connection to and streaming from some current [Apple/Android] smartphones. For safety reasons, always launch HondaLink applications or perform any other operation on your phone only when the vehicle is safely parked. State or local laws may limit use of texting feature, and Assist functions may be terminated without notice. Your wireless carrier's rate plans apply. Please see HondaLink terms and conditions for details. 13 Pandora, the Pandora logo, and the Pandora trade dress are trademarks or registered trademarks of Pandora Media, Inc. Used with permission. Compatible with select smartphones. See: www.pandora.com/everywhere/mobile. Not all devices compatible with USB connection. Your wireless carrier's rate plans apply. 15 SiriusXM services require a subscription after any trial period. If you decide to continue your SiriusXM service at the end of your trial subscription, the plan you choose will automatically renew and bill at then-current rates until you call SiriusXM at 1-866-635-2349 to cancel. See our Customer Agreement for complete terms at www.siriusxm.com. Fees and programming subject to change. XM satellite service is available only to those at least 18 years and older in the 48 contiguous United States and D.C. ©2014 Sirius XM Radio Inc. Sirius, XM and all related marks and logos are trademarks of Sirius XM Radio Inc.
16 HD Radio is a proprietary trademark of iBiquity Digital Corporation. Green vehicles are more popular now than they’ve ever been in the history of cars, which is pretty incredible considering the drop in gas prices we’ve all seen over the course of the last year. While fuel is more affordable than it been since Bill Clinton was in office, people are still snatching up green vehicles left in right, in part because they do save even more money at the pump than non-green models, and in part because they go a long way toward saving the environment. 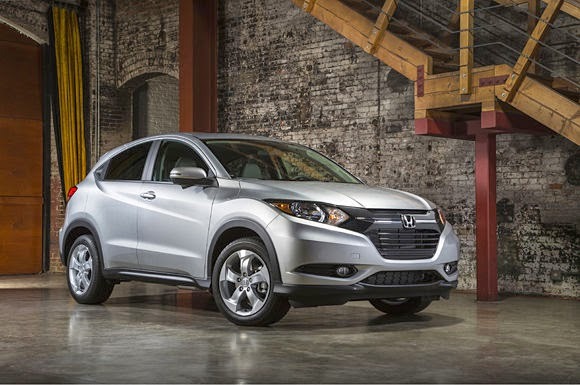 The wait for the all-new 2016 Honda HR-V has been a patient but tedious one, however, the friendly staff at Pacific Honda is thrilled to announce that Honda has set May 15, 2015 as the ship date for these slick new crossovers, which means it shouldn’t be too much longer after that when we have them available for test drives and, of course, purchase. 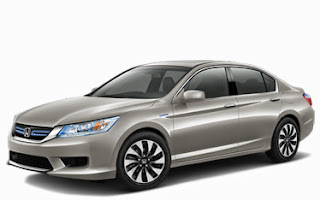 American Honda Motor Co., Inc. today reported April 2015 Honda and Acura vehicle sales of 130,068 units, with Acura cars rising 29.4 percent on sales of 5,932 vehicles and Honda trucks gaining 2.0 percent on sales of 52,635 units for a new April record. Overall American Honda sales decreased 1.8 percent versus a strong April 2014 sales total, with the Honda Division posting sales of 115,194 vehicles in April, a decrease of 2.7 percent for the month, and the Acura Division gaining 5.3 percent on sales of 14,874 vehicles in the same period. Honda light trucks continue to resonate with consumers shopping in mainstream market segments, witnessed by yet another robust month for the outgoing 2015 Pilot—even as it makes room for the 2016 model—plus another strong month for the best-selling CR-V as it set a new April record, nearly reaching 30,000 sales; both vehicles contributed to a new April Honda light truck sales record. Bucking recent trends toward trucks, the Fit blazed another 55+ percent monthly increase while Civic also gained solid ground, up more than 2.8 percent over April 2014. Honda light trucks set a new April record, rising 2.0 percent on sales of 52,635 units. 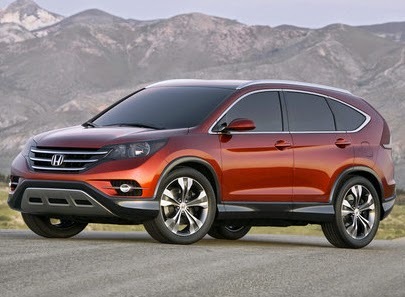 The best-selling CR-V also had record April sales, gaining 3.4 percent on sales of 29,452 vehicles. The outgoing 2015 Pilot posted sales of 11,222 vehicles—a stout increase of 28 percent in April. In the midst of a shrinking sedan market, Civic sales were up 2.8 percent for the month on sales of 28,380 and the amazing Fit posted sales of 6,529 units to leap 55.6 percent in April, while Accord posted strong sales of 27,251 units. 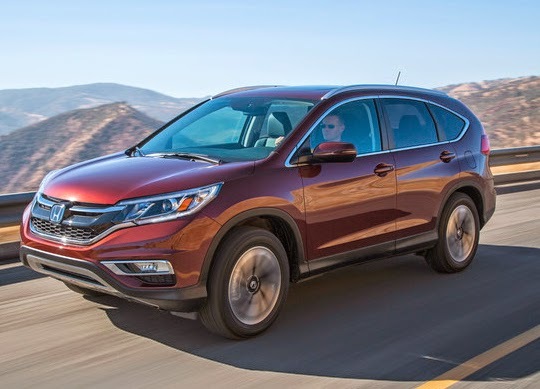 "With the CR-V and current Pilot selling so well, and the HR-V and all-new Pilot soon entering the market, our truck lineup is set to drive a very strong 2015 for the Honda brand," said Jeff Conrad, Honda Division senior vice president and general manager. "Though the scales are definitely tipped toward trucks at the moment, we're really pleased at how Fit, Civic and Accord continue to outperform their rivals in the retail marketplace." Even as Acura SUVs continue to perform well, Acura sedans showed renewed strength as the superbly balanced TLX set the bar for the brand in April, with sales of 4,093 units putting the TLX firmly in the top sales tier of its segment and pushing total Acura sales up 5.3 percent for the month. Acura's pace-setting luxury SUVs—RDX and MDX—also continued with brisk sales in April. 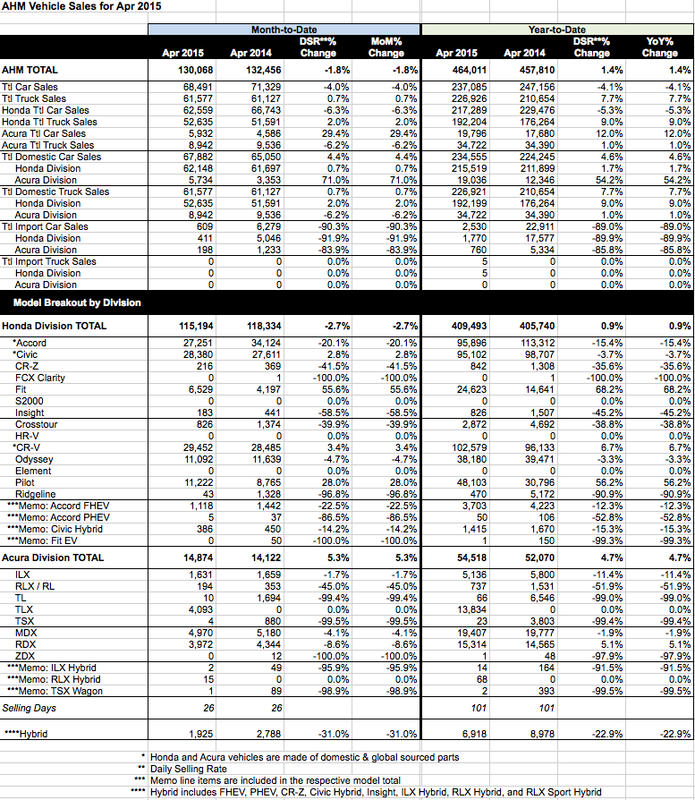 Total Acura brand sales gained 5.3 percent in April, with total sales reaching 14,874. TLX drove the April increase on sales of 4,093 units for the month; sedan sales are up 29.4 percent since the beginning of the year. Combined MDX and RDX sales continue to be a formidable force in the luxury SUV game—despite a changeover from 2015 to 2016 model production—with RDX sales reaching 3,972 and MDX finding 4,970 buyers in April for a total of almost 9,000 units for the month. "The Acura TLX has renewed momentum that will continue to grow in the months ahead as it makes major inroads in the tough luxury sedan market," said Mike Accavitti, Acura Division senior vice president and general manager. "Despite tight supply during the transition from outgoing 2015 models to newly refreshed 2016 models, the RDX and MDX continued to perform exceptionally well in April." From 1993 through 2011, Pacific Honda has been #1 in San Diego County for New Car and Certified Pre-Owned sales. Therefore, you can rest assured knowing that you are getting a great vehicle at a GREAT price! *Based on information provided by American Honda Sales Records from 1993-2011. Pacific Honda | THE BLOG | SAN DIEGO, CA. Simple theme. Powered by Blogger.